Even the best non-disclosure and non-competition agreements are not worth anything if not enforced correctly. A lot of times a company rushes to court asking the judge to stop a former employee or his new employer from using the company’s confidential information or soliciting its customers based on the agreements that the former employee had signed with the company. Such requests, while appearing very reasonable at first blush, are often rejected by the courts as not being specific enough to let defendants know what they can and cannot do. For example, how is the defendant supposed to know who the company’s customers are, especially, if there are thousands of them? Or, if the order does not define trade secrets, how can the defendant know what is it that he is prohibited from using or disclosing? BOTTOM LINE: When seeking a temporary injunction in a case involving unfair competition, non-compete or non-disclosure agreement breaches, shooting for the moon so you can land on the stars is not a good approach. Rather, the party seeking an injunction should aim as closely as possible at the particular star on which it wants to land. Leiza litigates non-compete and trade secrets lawsuits in a variety of industries in federal and state courts. For a consultation regarding a dispute involving a noncompete agreement or misappropriation of trade secrets, contact Leiza at Leiza.Dolghih@lewisbrisbois.com or (214) 722-7108 or fill out the form below. You will see from this map (created by Beck Reed Ridden) that only three states in the entire country – California, North Dakota, and Oklahoma – do not enforce non-compete agreements of any sort. The rest of the states, including Texas, enforce such agreement or are undecided on that issue, which means they could enforce them given the right circumstances. BOTTOM LINE: In Texas, non-compete agreements are enforceable if they meet certain requirements and contain reasonable restrictions on the term, geographic scope and the scope of the restrained activities. Companies should take advantage of this legal tool available to them and make sure that their employment agreements with key employees have properly drafted non-compete clauses that protect their good will, confidential information, and trade secrets. Leiza litigates non-compete and trade secrets lawsuits in a variety of industries. If you are a party to a dispute involving a noncompete agreement or misappropriation of trade secrets, contact Leiza at Leiza.Dolghih@lewisbrisbois.com or (214) 722-7108. In 2016, there have been some major developments involving confidentiality and non-compete agreements law, which are likely to have some repercussions in 2017. Here’s a summary of the most important issues that companies should be aware of going into the new year. 1. The Federal Defend Trade Secrets Act. This statute, enacted in May 2016, creates a federal question jurisdiction for misappropriation of trade secrets, allows companies to seize their trade secrets out of the hands of competitors in some circumstances, and provides whistleblower protection to employees when certain conditions are met. In 2017, as companies begin to take advantage of the statute, the courts will begin creating a new body of law interpreting its provisions. 2. SEC Enforcement. The SEC will continue to go after the companies whose confidentiality agreements and policies they may find to violate the SEC’s whistleblowing rules. Making sure that confidentiality agreements include the language specified in the federal Defend Trade Secrets Act may help with SEC’s scrutiny. 3. Choice of Law Issues. Choice of law issues in interstate non-compete and confidentiality disputes will continue to be of major concern to companies who have out-of-state employees. A number of states in 2016 passed statutes dramatically limiting non-competes and California passed a statute that prohibits application of other states’ laws to its employees’ non-compete agreements. Business owners should make sure that their non-competes are enforceable in the jurisdictions in which they intend to enforce them. 4. Disclosure of Trade Secrets During Litigation. This will continue to be a major point of dispute in trade secrets and non-compete lawsuits. For example, earlier this year, the Texas Supreme Court addressed what a trial judge must consider before allowing a competitor’s corporate representative in the courtroom during the testimony that might reveal the adverse party’s trade secrets. Thus, in 2017, those companies that are engaged in trade secrets misappropriation litigation in Texas will need to consider how this balancing test will apply in their particular circumstances. Many other states’ courts faced a similar issue in 2016 and have fashioned their own rules regarding when the disclosure of trade secrets in litigation is appropriate. Leiza litigates non-compete and trade secrets lawsuits on behalf of COMPANIES and EMPLOYEES in a variety of industries, and knows how such disputes typically play out for both parties. If you need assistance with a non-compete or a trade secret misappropriation situation, contact Leiza for a confidential consultation at Leiza.Dolghih@lewisbrisbois.com or (214) 722-7108. Myth #1: Non-compete agreements are not enforceable in Texas. This is absolutely false. In Texas, non-compete agreements are enforceable if they meet certain requirements spelled out in the Texas Covenants Not to Compete Act. Even if they do not meet those requirements, a lot of times, a judge can reform, i.e. rewrite, them to make them more “reasonable” and then enforce them. Myth #2: Texas is a right to work state, so an employer cannot prevent employees from going to work for a competitor. This is also false. A “right to work state” simply means that employees in Texas cannot be fired for joining unions. It has nothing to do with the enforceability of the non-compete agreements. So, while Texas is a right to work state, that doesn’t mean that the non-competes here are invalid. Myth #3: An employer threatening to fire an employee if s/he doesn’t sign a non-compete agreement makes such agreement invalid. This is false. Because Texas is an at-will employment state, an employer may change the terms of employment at any time, including adding non-compete restraints to an already-existing employment relationship. Thus, with rare exceptions, employers may force employees to sign non-competes under a threat of termination. Myth #4: Since an employer never enforced its non-compete agreements, it won’t/can’t enforce it against a particular employee. Again, this is false. Employers typically consider many factors when deciding whether to enforce a non-compete agreement, so while they might decide not to enforce the agreement against one employee, they may be motivated to do so against another employee. Myth #5: If a non-compete agreement looks/sounds reasonable, there is no way to fight it. This is false. There are many defenses to non-compete agreements, and whether a particular non-compete agreement will hold up in court depends on the specific language of the agreement as well as employee’s job duties, length of employment, access to confidential information and a myriad of other factors. The bottom line is that employees in Texas cannot afford to ignore non-compete restraints in their agreements and, when in doubt, should seek legal advice to understand the consequences of signing a non-compete agreement, or switching jobs or starting a competing business when subject to a non-compete. Planning ahead is key when it comes to non-compete agreements in this state. Stay tuned for part II to find out common non-compete agreements myths for employers. Leiza litigates unfair competition, non-compete and trade secrets lawsuits on behalf of companies and employees, and has advised hundreds of clients regarding non-compete and trade secret issues. If you need assistance with a non-compete or a trade secret misappropriation situation, contact Leiza for a confidential consultation at Leiza.Dolghih@lewisbrisbois.com or (214) 722-7108. Last month, a Texas Court of Appeals denied an insurance agency’s application for a temporary injunction against its former President because it held that the non-compete agreement, as written, did not restrict the President from competing. The agency tried to enforce the non-compete and non-solicitation agreement to prevent the President from soliciting the agency’s clients for the purpose of selling or marketing any products or services that would compete with the agency, and it was able to obtain a temporary restraining order (TRO). However, the trial court refused to convert the TRO into a temporary injunction. The reason the company lost at the temporary injunction hearing is because both the non-compete and non-solicitation clauses in the agreement stated that the President could not compete with or solicit the agency’s clients “during the term of CMC Account Development Sub Agent Agreement, and for a period of two (2) years after the termination of the Agreement.” However, the agency’s representative and the President both testified that he was never a sub agent (i.e. sales person) for the agency and that he did not have a CMC Account Development Sub Agent Agreement. Basically, the non-compete and non-solicitation restraints were tied to the length of a non-existent agreement between the agency and the President. In most likelihood, the language was left over from the standard contract form that the agency used for its sales representatives, and was included in the President’s agreement due to oversight. As the result, the company was unable to stop the President from competing. Takeaway: This case demonstrates why the companies should conduct an audit of their non-compete and non-solicitation agreements at least once a year to make sure that (1) the agreements are enforceable, (2) they have a legible copy of the agreements signed by both parties, and (3) the agreements will adequately protect the company if they have to be enforced. Leiza litigates non-compete and trade secrets lawsuits on behalf of COMPANIES and EMPLOYEES in a variety of industries, and knows how such disputes typically play out for both parties. 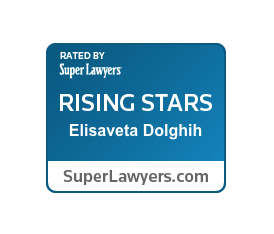 If you need assistance with a non-compete dispute, contact Leiza for a confidential consultation at Leiza.Dolghih@lewisbrisbois.com or (214) 722-7108. With so many companies moving their headquarters from California to Texas in the recent years, non-compete disputes involving employees and employers who have ties to both states have multiplied. In these types of cases, one of the first questions the courts ask is which state’s law applies to the non-compete agreements in dispute – California’s or Texas’s? You can find an example of such a case here. Under California law, non-compete agreements are largely unenforceable. To the contrary, Texas law recognizes reasonable non-compete agreements and will enforce them. Last month, California governor signed into law Senate Bill 1241, which, effective January 1, 2017, will restrain the ability of employers to require employees to litigate or arbitrate employment disputes (1) outside of California or (2) under the laws of another state. The only exception is where the employee was individually represented by a lawyer in negotiating an employment contract. Takeaway: Texas employers with California employees need to recognize that an attempt to enforce Texas non-compete agreements against their employees who primarily reside and work in California may backfire after January 1, 2017, resulting in employer having to pay employees’ attorney’s fees related to the dispute. Additionally, for those employees who might have dual residences in both states and might regularly perform work in both states, the question of whether they “primarily reside and work” in California or Texas may become a pivotal issue to the enforceability of their Texas non-compete agreements. Most importantly, employers should take advantage of the exception in the statute as well as identify other legally allowed restrictions under California law that would serve to protect the company’s interests even against California employees. Leiza litigates non-compete and trade secrets lawsuits on behalf of COMPANIES and EMPLOYEES in a variety of industries, and has advised hundreds of clients regarding non-compete and trade secret issues. If you need assistance with a non-compete or a trade secret misappropriation situation, contact Leiza for a confidential consultation at Leiza.Dolghih@lewisbrisbois.com or (214) 722-7108. Some states prohibit these restraints in employment contracts completely. Others allow one but not the other. Texas allows both. These restrictions on employees are meant to protect employers’ investment in their employees and confidential information shared with them during their employment. A prudent employer will use one or both of these covenants to protect its confidential information from ending up in the hands of a competitor. A non-compete covenant restricts an employee’s right to engage in a business activity that is competitive with his employer. Whereas a non-solicitation clause restricts an employee’s ability to solicit the customers or employees of his former employer. Often, employers will also include a confidentiality clause, which will prohibit their employees from sharing with third parties or using any confidential information they learned while working for the employer. Whether an employer should include all of the above clauses or only some of them in its employment agreements depends on what role a particular employee will play in its business, how much customer interaction she or he will have, whether she or he will have access to any of the employer’s confidential information, and several other factors. Want to Switch Jobs, But Not Sure if You Can? Do Not Let A Non-Compete Hold You Down. Many employees sign non-compete agreements without giving it a second thought, but then a time comes when the company starts slumping, they get a new boss that they do not particularly like, receive a better job offer from a competitor of their current employer, or they want to strike out on their own. All of a sudden, the non-compete restraints come out of the shadows looking rather menacing. Should the employee take a new job or open a competing company and risk a lawsuit from the former employer? Should she or he discuss the non-compete agreement with the current employer and see if they’ll agree not to enforce it? Should she or he forego the new job in order to avoid facing the wrath of the former employer and the legal costs associated with it? Many employees will seek advice from former co-workers, friends, or family, or on the internet. However, seeking information about enforceability or validity of non-compete agreements in Texas on the web is like seeking information about a possible illness from WebMD. There are many general statements, but no realistic explanation of how it applies to the employee’s particular situation. This is, of course, because the area of non-compete law in Texas is a gray area. Rarely is an entire non-compete agreement invalid or iron-clad. Most of the time, the agreement’s force depends on the specific language of the agreement, the type of business the employer is involved in, what employee did for that employer, for how long, whether the employee received confidential information, goodwill, or stock options from the employer, whether employees’ duties changed at any time during the employment, whether the employer has “unclean hands,” and many other factors. 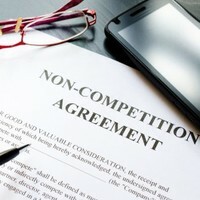 So, when you start wondering about whether your non-compete will hold you back in accepting a job offer or opening your own business, do yourself a favor, and after doing online research and talking to your friends or co-workers, consult with an attorney in your state regarding whether your non-compete agreement is enforceable as well as what is the likelihood of the employer enforcing the agreement. A good attorney will help you structure your departure from the former employer in a way that will minimize the risk of a non-compete lawsuit, will help deflect any bullying attempts from the former employer, and will be able to provide you with a realistic risk assessment of any non-compete-related litigation. When facing a possible non-compete enforcement situation, an ounce of prevention is worth a pound of cure and being proactive about it can save major headaches down the road. Leiza litigates non-compete and trade secrets lawsuits in a variety of industries, and has advised hundreds of clients regarding non-compete and trade secret issues. If you need assistance with a non-compete or a trade secret misappropriation situation, contact Leiza for a confidential consultation at Leiza.Dolghih@lewisbrisbois.com or (214) 722-7108. 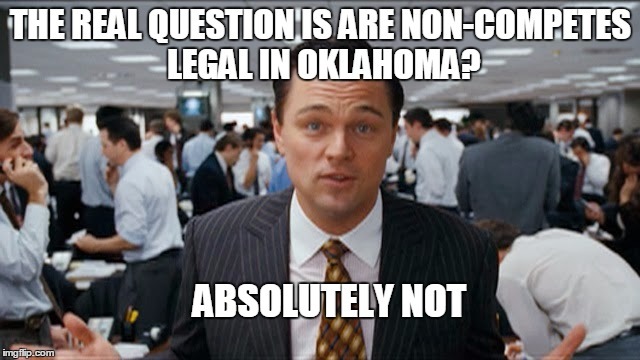 Turns out Oklahoma and California have much more in common than one would imagine – they both prohibit non-compete agreements. The Fifth Circuit Court of Appeals recently confirmed in Cardoni, et al. v. Prosperity Bank what many Oklahoma businesses already know – non-compete restraints in Oklahoma do not hold up in court. What makes this case interesting is that the Fifth Circuit refused to apply Texas law to bankers’ non-compete agreements even though they agreed that their agreements should be governed by Texas law, because Texas law was contrary to Oklahoma’s public policy, which prohibits such agreements under any circumstances. As the result, the Oklahoma bankers were allowed to compete despite the non-compete clauses in their employment contracts with a Texas bank. Non-compete agreements are governed by different laws in each state. While the courts usually will defer to the parties’ choice of law to govern their employment contracts, that is not always the case. Where the law specified in an employment agreement contradicts a “fundamental public policy” of the state where the employee works, courts may refuse to apply the chosen law. If possible, a company should make sure that its non-competes are enforceable in both – the state specified in the contract and the state where the employee works. If that is not possible or an employee works in a state that prohibits non-compete agreements, the employer should look to see whether confidentiality or non-solicitations clauses may be used to achieve the same or similar results. The bottom line is that figuring out which law applies to non-compete agreements in different states and whether they will be enforced in court down the road involves a factually intensive and complicated legal analysis. For higher-level employees, it pays to have the analysis done before non-compete agreements are signed and not after such employees have already opened a competing business or joined a competitor.